In this book, David R. Carlson sets Gower in a context in which he has not been set before. Usually discussed as, in Anne Middletons phrase, a public poet, a commentator on the condition of English society in the last decades of the fourteenth century, Gower appears here as a state propagandist. Carlson takes Gowers less-read works, especially Cronica tripertita and In Praise of Peace, and places them within a selection of Latin and vernacular texts which he associates with propaganda and which stretches back to 1314 and the battle of Bannockburn. 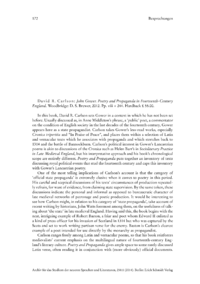 Carlsons political interest in Gowers Lancastrian poems is akin to discussions of the Cronica such as Helen Barrs in Socioliterary Practice in Late Medieval England, but his interpretative approach and his books chronological scope are entirely different. Poetry and Propaganda puts together an inventory of texts discussing royal political events that stud the fourteenth century and caps this inventory with Gowers Lancastrian poetry.